Let's go back in time to 1927 and imagine you are a newly initiated member of the Columbus lodge of the B.P.O.E.. You decide to take your wife and 9 year old daughter Susie out for the family's first dinner at the "country home" of the Elks- The Elks' Country Club. Upon entering the clubhouse's warm and friendly confines, you and your loved ones encounter a wizened yet animated, agile man whose appearance strikes you as definitely incongruous given the posh environs. Attired in full native American regalia complete with headdress, a necklace of eagle claws, and beaded moccasins, he seems completely relaxed and at home in the clubhouse's corridor. With the fearlessness reserved only for the young, Susie marches right up to the old man and asks, "Are you a real Indian?" The old man flashes a warm smile at his young inquisitor and replies, "Why, yes, young lady, I am a full-blooded Wyandot Indian- the last one left of our tribe. You can call me Bill Moose. Others call me 'Indian Bill.' But the name my mother and father gave me when I was born in 1837 is 'Kihue.' "
You do the quick math in your head and enter the conversation. " Golly, Mr. Moose, that would make you 90 years of age. You don't look anywhere near that old!" "I attribute my long life to living close to nature, and observing the custom of my tribe in sleeping out of doors during the summer, and one night each month throughout the winter with only one blanket for cover." Susie asks an appropriate follow-up question: "So do you live in a tee-pee when you aren't sleeping outside?" Bill Moose, ever gentle and patient with children, responds, " I live alone in a small shack right next to the railroad tracks just south of Morse Road and only a few minutes walk from where we are standing. I cook my food in a single pot, although I sometimes eat my meals here at The Elks'." Your wife, with a note of concern in her voice asks, "don't you get lonely, living all by yourself out in the woods?" "No, not at all. Lots of people come visit me at my shack. I tell them stories about the Wyandots, and my days with the circus. I guess my place has become something of a tourist attraction. Folks come from all over to take my picture, buy postcards or Indian trinkets. And here at The Elks', I have a chance to meet nice people like you. I keep busy walking. You may see me hiking along the railroad track, in the ravine that runs through the course, or over by the Scioto River. That river is very meaningful to my people. I was born and spent my early days up the river in what is now Upper Sandusky." Susie, eyeing the man's elaborate headdress and robes, probes further. "Are you a chief?" Moose shakes his head. "No! I received what I am wearing now for the part I played as an Indian rider in the Sells Brothers Circus. 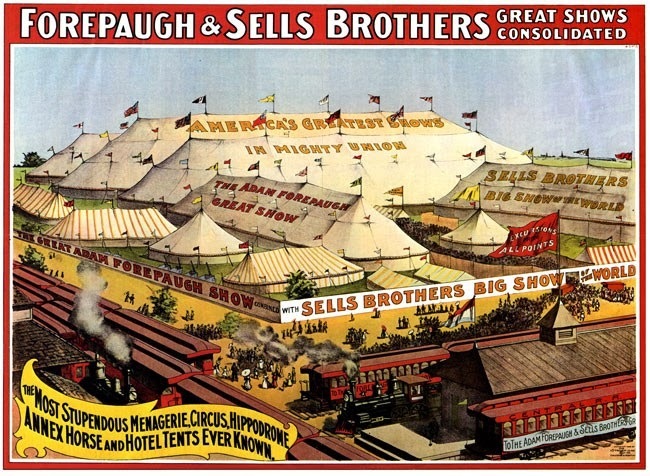 I worked with the circus for nine years. I traveled all over the west, and Australia too! Even met Buffalo Bill and Annie Oakley along the way!" " But you asked about chiefs. 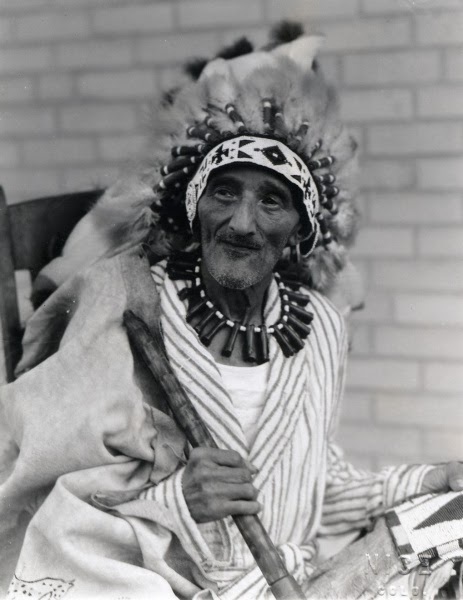 The greatest was Leatherlips who was the Wyandot chief during the time my father was alive. He was a man of peace, who made friends with the white man after many years of war. Unfortunately there were other tribes who were angry with Leatherlips for refusing to continue to make war against the settlers. In 1810 a band of those Indians who wanted to fight came to a place about 12 miles north off Columbus along the Scioto River Rd. [near where the Columbus Zoo is now] and there put Leatherlips to death because of his peaceful intentions. My family and I walked downriver all the way from Upper Sandusky and saw the place where this occurred. We also hunted and fished around here. Our new chief Pancake continued to keep the peace with the whites. One reason we stayed peaceful is that our tribe was converted to Christianity by a Methodist missionary." Susie, asks a question which you were reluctant to ask the old Wyandot. "What happened to the rest of your tribe?" Bill Moose reflects for a moment and a look of wistfulness crosses his lined face. "Our tribe was down to about 600 by 1843. With all the settlements, there wasn't room for us anymore, and the Wyandots were pushed out of Ohio. Most of our tribe left Upper Sandusky by wagons and buggies for a reservation in Kansas. Twelve families refused to leave, and mine was one of them. I was only six years old at the time. I worked with the settlers doing many different things including helping them clear their land. The remaining Wyandots either died out or moved away. I am the last one." "When did you move to Columbus?" you inquire. "My family first moved down from Upper Sandusky around 1850. After that, my travels took me away to many places, but I always came back to this area. 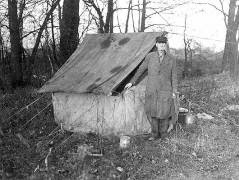 I moved into the shack in 1915 at the age of 78. I had spent time helping settlers clear land nearby here in this place you now call Clintonville, and I felt at home here. People have been very good to me here. I intend to stay here until "The Great I am" calls me." The old man, still with a remarkable spring in his step, takes his leave. As you enter the dining room, you encounter the club manager. You remark to him, "that Bill Moose is a fascinating man. I take it he is not a member!" The manager replies, "No. But he is always welcome here at The Elks'." 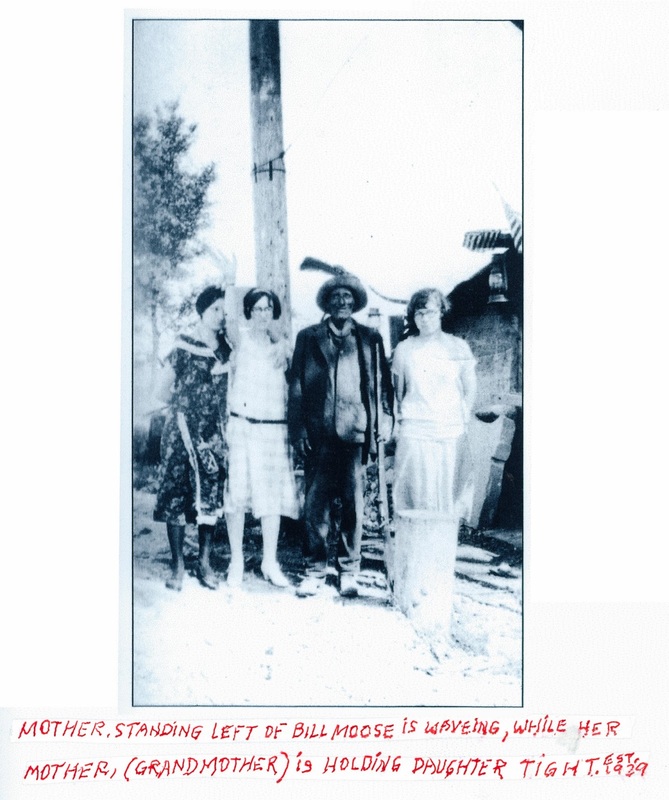 Bill Moose lived until 1937 passing away just two months short of 100 years of age. It is said that one measure of a man's greatness is how many people attend his funeral. By that measure, Bill Moose was a very great man indeed! The Rutherford Funeral Home reported that Bill's was its largest funeral ever with an estimated 10,000 to 12,000 mourners attending. Bill was buried in full ceremonial regalia high on a bluff overlooking the Scioto River on "Wyandot Hill" located at the intersection of Riverside Drive and Lane Road in what is now Upper Arlington. Worthington's Mayor Leonard Insley gave the eulogy. He along with others helped raise funds for a permanent memorial. 39 bowling ball sized boulders, stacked in the form of a tee-pee and marked with inscripted drawings of Indians, solemnly mark the site of the grave. The Indians from this territory. Further accolades came to Bill Moose posthumously. The ravine which Bill roamed bisecting Elks'- Wyandot is known as "Bill Moose Ravine." The little brook running through the ravine is called "Bill Moose Run." What was there about this man, who lived his life virtually penniless and alone in a shack on the railroad right-of-way, that brought forth such an outpouring of tributes and affection? Yes, he was the last of the Wyandots. But there was more to Bill than that. He was one of those rare people whom everyone loved and wanted to know. He told wonderful stories; he enchanted the young, and charmed their elders. Kaye Kessler, the dean of Columbus sportswriters , visited Bill's shack often, and came to know him well. 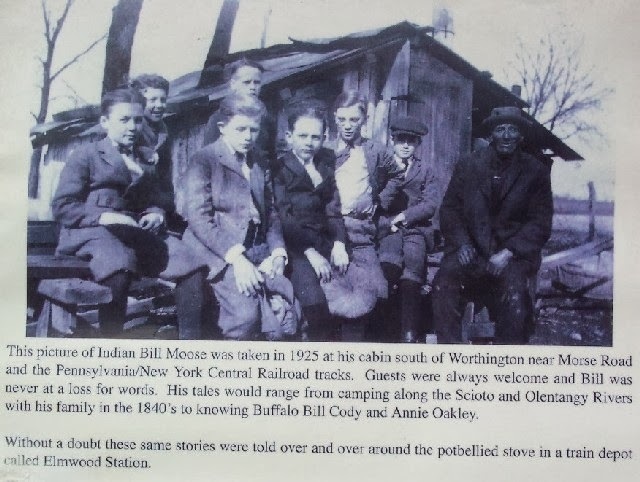 He recalls that on Sundays, so many people would crowd the railroad track "to get a peek at or close-up [of Bill] as he spun tales," that Kaye and his friends would sometimes be called upon to direct traffic. Bill Moose was a teacher too, preaching to all within earshot love, understanding, and the beauty of nature. He demonstrated how to live a rich full life without the need of material possessions. And he is an important and certainly unique part of the fabric of Elks'-Wyandot that makes its history so special. Acknowledgements: www.findagrave.com; Bill Moose Crowfoot: "Last of the Wyandots Tribute," James L. Thompson, 2003; "Last of the Wyandots," The Linworth United Methodist Church Historical Society; www.Dublinhistoricalsociety.com; Historical Marker Database; www.dispatch.com and photo published there from Walter Nice collection; Forepaugh and Sells Brothers poster from www.images.search.yahoo.com; Kaye Kessler, Betty Huber, Bill Huber, Jim Huber, and Shirley Hyatt.